I whipped up a set of these bowls in just an evening, in three sizes that “nest” together. They’ve got flat bottoms so they don’t tip over, and made with super chunky yarn they’re very nearly instant gratification. 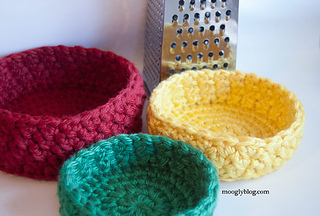 Simple stitches, with textured sides to keep them interesting, they make a great gift, are a fun way to organize all that clutter, and add a pop of color wherever they go. 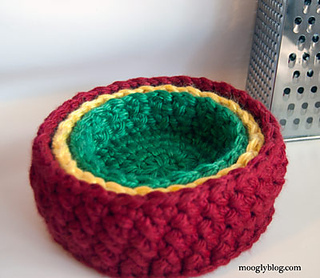 UPDATED 9/10/12 - Added instructions for a bigger Extra Large size bowl at reader request!